The supply of high quality products and certified processes has been awarded by our national and international customers for more than nearly 40 years. 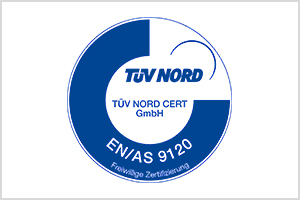 To guarantee a continuous quality level, we use a system that is based and certified to the ISO 9001:2008. We all at KASTENS & KNAUER have committed ourselves to work within this system and also to improve wherever we can. For nearly 30 years, KASTENS & KNAUER is also a supplier to the aerospace industry. Along with that it is mandatory to be certified to international quality levels. In addition we carry lots of aerospace customer, so called “in-house approvals”. If you have any questions or need references, please do not hesitate to send your questions to us.